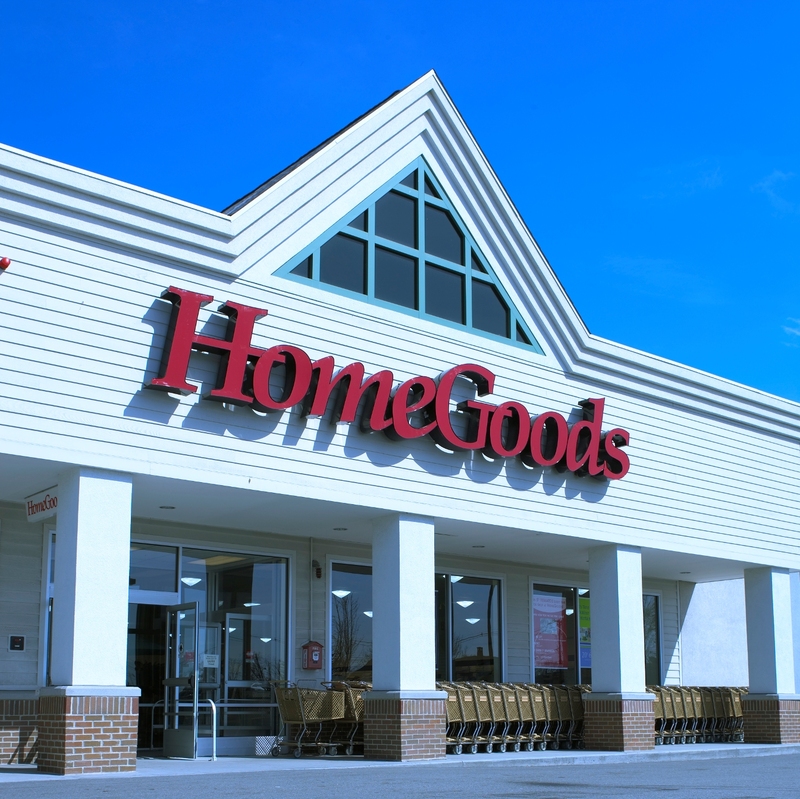 Home Goods has arrived in Marin County! Hallelujah, we’ve been saved. I know I should be left on an island to wither and die for saying this but … I’m not all that impressed with Home Goods. (wince) I know, I know, what’s wrong with me? 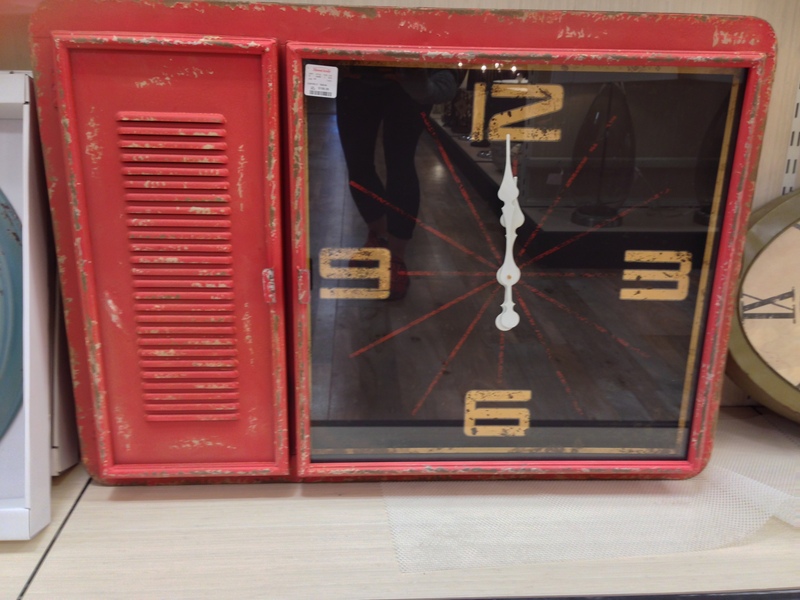 Pretty much every blog I read sings the praises of Home Goods. Bloggers were constantly “partnering” with Home Goods (and, I’m assuming, getting paid) into some esteemed design challenge. It all looks great on paper. Especially at a distance … with some awesome lighting … and some cool photo-processing tricks. 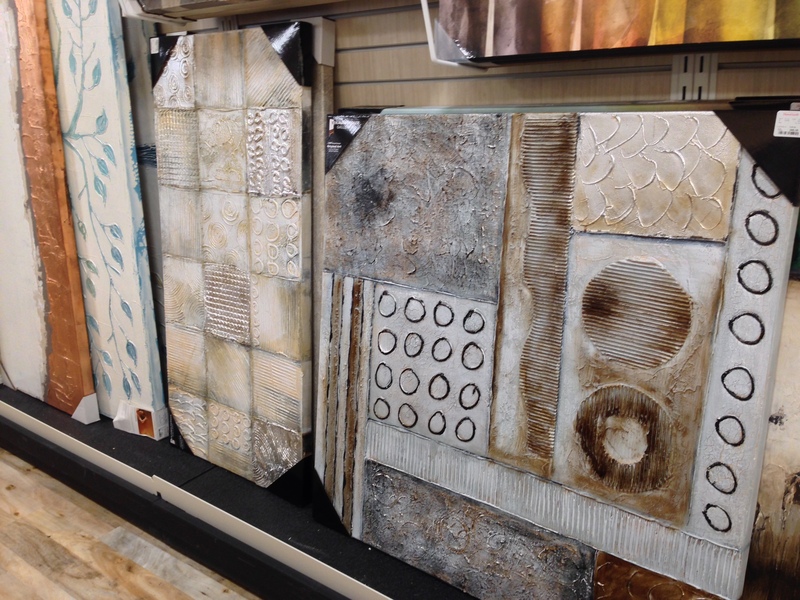 I recently toured the new San Rafael store and it stirred up the same feelings I felt when I first walked into a Home Goods a couple of years ago. We were at the tail end of our living room remodel. I had seen so many blog/magazine/TV shows that were crushing on the store that I was more than willing to drive an hour and a half to check it out. Mocha in hand, I was armed with an laundry list of things I wanted for our room: lamps, curtains, artwork, side chairs, side tables, an area rug, random knick knacks. When I walked in, I thought I’d hit the jackpot. Unbelievable! It’s all here, I thought to myself. And then I started walking around, checking things out. I quickly crossed art off my list. 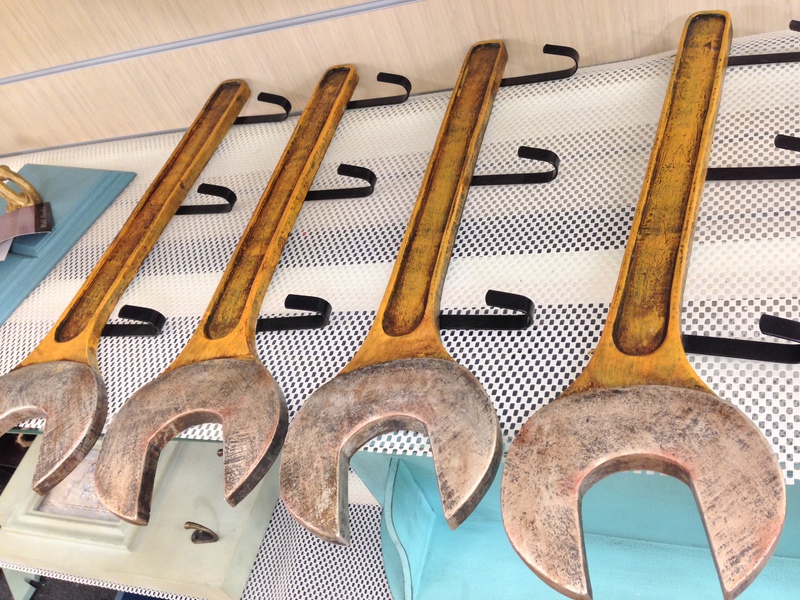 While inexpensive, the stuff was … cheap. Furniture? That was quickly crossed off as well. Almost everything I sat on felt extremely uncomfortable and unsubstantial. Tables were wobbly, you could tell the wood used was cheap and the finishes were a sloppy. But I’ll admit it looked great from afar! And the price was right! I had to get something! I considered a fake book that you could display on your coffee table and appear considerably well-read. But wait! Look inside! That’s not knowledge — that’s where you can keep remote controls! Eventually I got two lamps and a few pieces of meh art. As soon as I got home, I was already plotting my trip to return most of it. So, I wasn’t very hopeful when I went to the San Rafael store. This is one of the first things I saw. 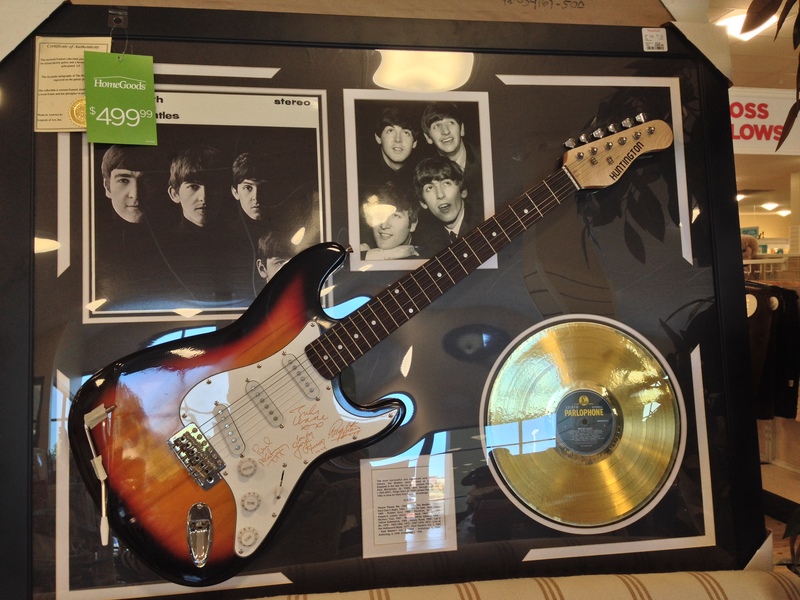 Yes, for $499 you could get a real guitar that was not played by the Beatles but was professionally etched with the signatures they wrote anywhere else except said guitar. The whole thing was fake. This whole thing made me laugh a little and just confirmed what I already felt about Home Goods. I delved further into the store. I wasn’t a fan of the kitchenware; plates, bowls and such. A lot of it was thick, cheap ceramic that had this blah country kitsch to it that I just wasn’t into. Heath Ceramics it was not. 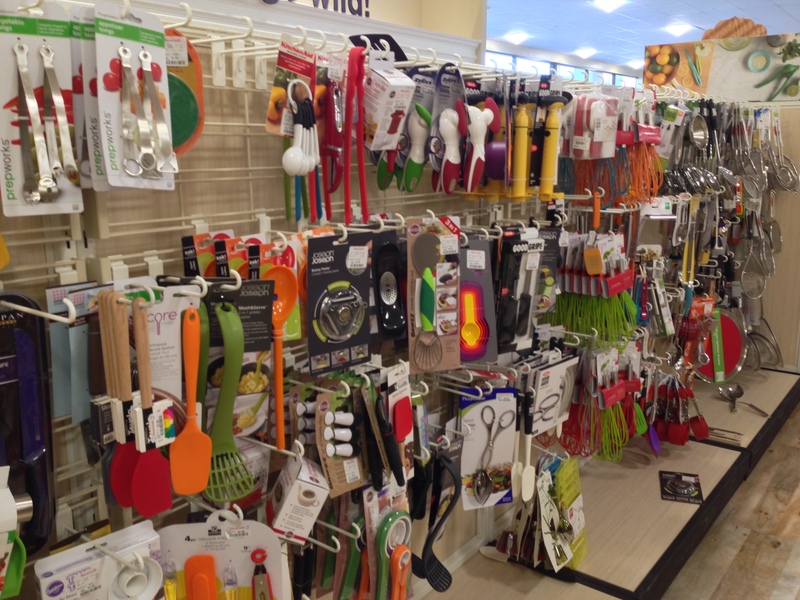 But when I rounded the corner to the kitchen gear section, that’s when I saw the beauty of Home Goods. Heck yeah! And look at this thing? I could cook a whole cow in it! 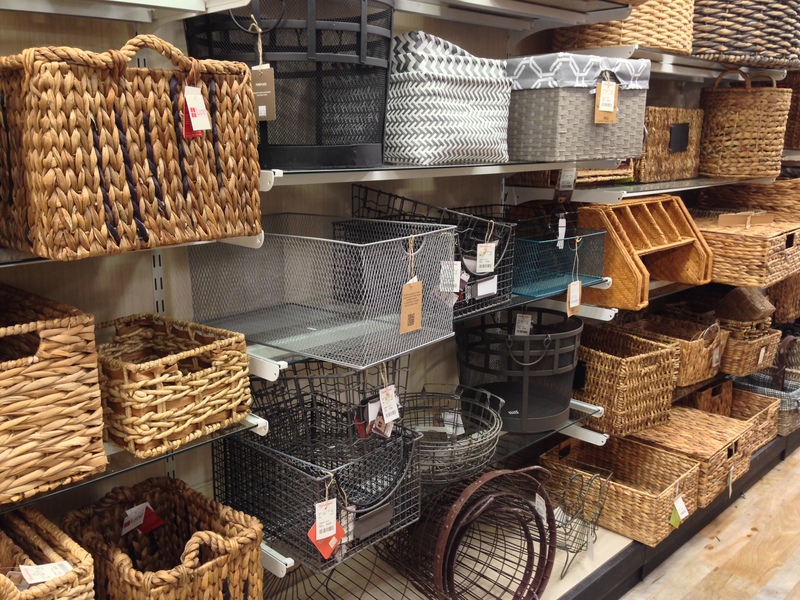 And then, of course, there are the baskets. Hard to argue with the potential here! The kids section was cute! But more for the baby generation. 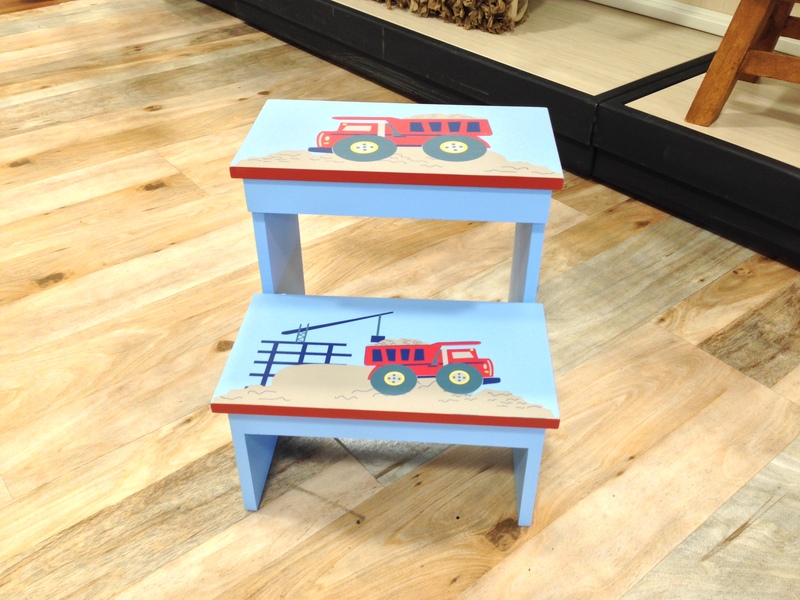 Although I did see this adorable step stool that Jack would’ve LOVED! Coooooonstruction, as he might say. I was prepared to be unimpressed by the art section, but I was intrigued with this interesting clock. It measured about 2 feet by 3 feet. It was kinda cool how it had two doors and shelves inside. But … what would I put in it after I hung it high on the wall? Still it was pretty unique. 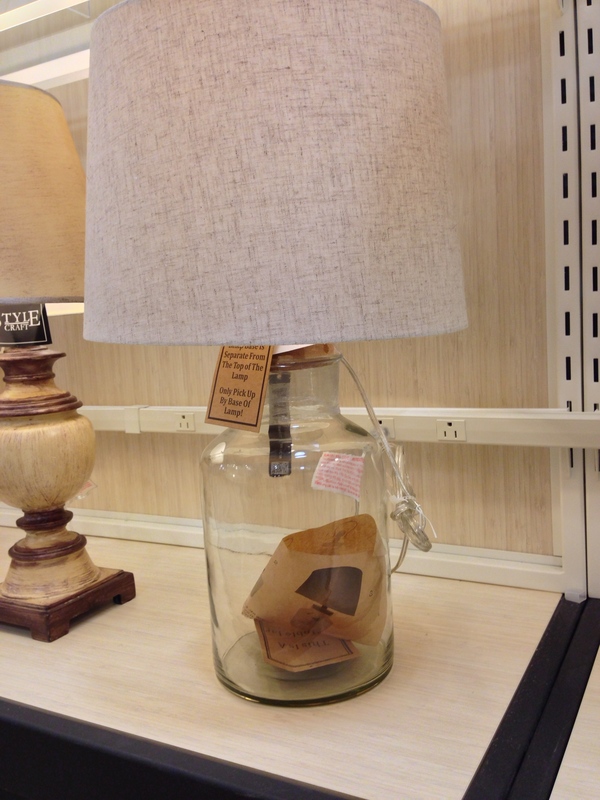 The next two items encapsulate exactly what I don’t like about Home Goods. 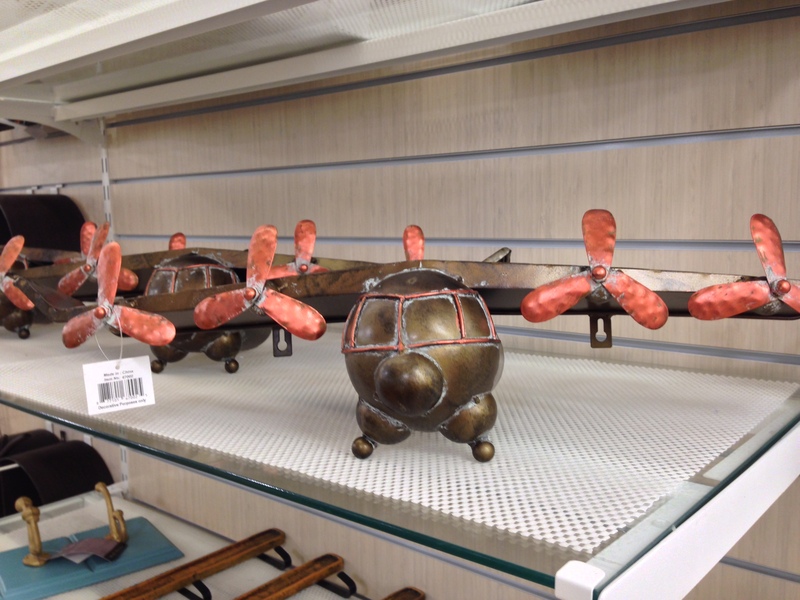 Ok, so here’s what I liked about my tour of Home Goods. Found these holiday candle holders hard to resist. These lanterns were HUGE … and super cheap. This was a lovely watercolor. I couldn’t believe I was saying that in a Home Goods! I could see this in my kitchen! Adorable for one of my girls’ rooms. 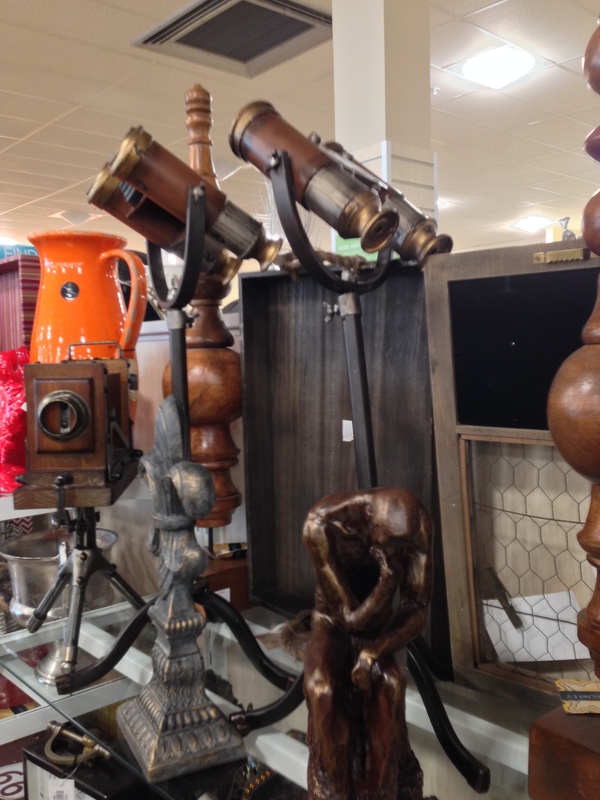 Ok, before I lose myself, here are some of the things that made me shudder at Home Goods. So many things popped in my head when I saw these binoculars. “Well, we’re a family of binocular-makers, so.” Or “Have a good night. I’ll see you when you get home.” I could go on and on. I think the position of The Thinker says it all. 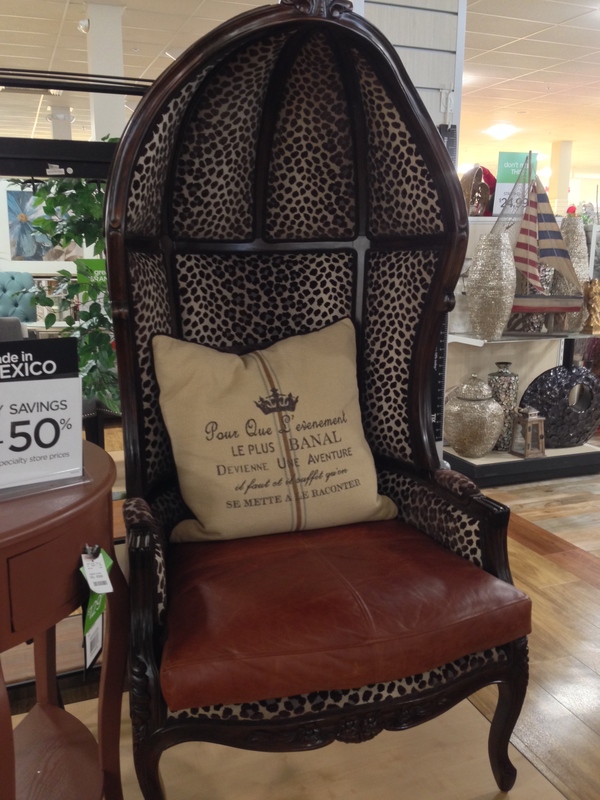 I would need to seriously consider what kind of cat to get whilst siting upon this mighty throne. 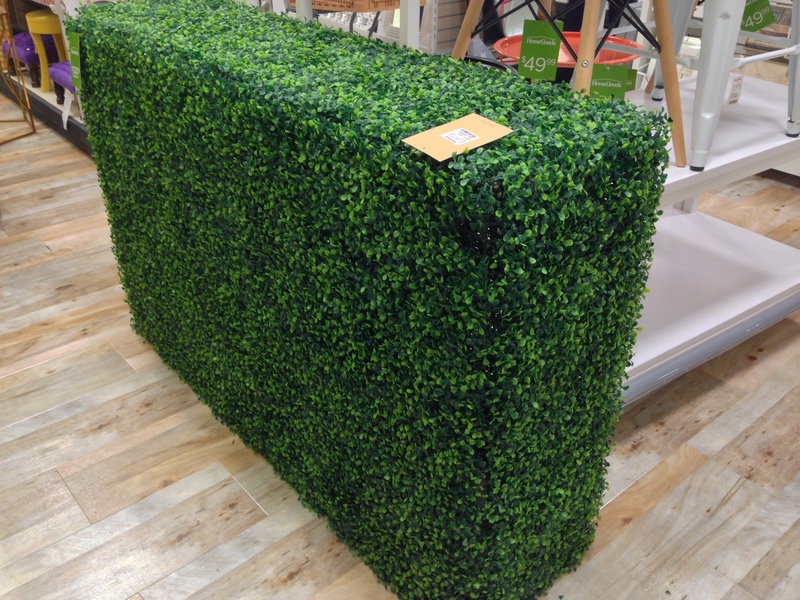 I’m at a loss of what to do with this $300 fake foliage divider. In closing, sure, I guess there’s some benefit to Home Goods. But there’s a lot of cheesy ball crap as well. While I was pleasantly surprised by much of the San Rafael store’s stock, I couldn’t help wonder about it’s quality in a year or so when people have picked through the goods.